Begin your search by using the above tool bar. Click 2 or 3 times to enlarge articles. The Whittier Art Association formed during the Depression, in 1934, for the purpose of bringing art to the growing rural town of Whittier. The fledging Art Association opened its first gallery and art studio in a donated space on Philadelphia Ave. in Whittier. Their great success can be attributed in part, to the brilliance and tireless work of a woman named Mabel George Haig. Mabel Haig was the wife of Myron Haig, who served as secretary of the Whittier Chamber of Commerce from 1915 to 1925. Mabel enjoyed a career as an artist, becoming a member of the California Art Club, the California Water Color Society, and the Laguna beach Art Association. She exhibited at the Laguna Art Gallery beginning in 1921, and was a close friend of the Laguna Beach Art Association co-founder Anna Hills. Mabel also participated in art exhibits in Los Angeles with many of the most prominent of the California artists. A number of the artists from Laguna and Los Angeles came to exhibit at the Whittier Art Gallery. Whittier has the Southland’s best designed, best equipped small public art center Whittier has shown Southern California the way. Artists came from Laguna Beach, Los Angeles, and Pasadena to exhibit; Edgar Payne, Conrad Buff, Glen Lukens, Hanson Puthuff, Emil Kosa, Phil Dike, Sam Hyde Harris, Milford Zornes, and countless others. The work of American artist Norman Rockwell was exhibited in 1950. Disney artists Tyrus Wong, Ben Messick, and Ralph Hulet also exhibited. Art Landy, who worked on Pluto cartoons and Peter Pan, became the Gallery president in 1948. Painter Ida O’Keeffe, sister of Georgia O’Keefe, exhibited twice in solo shows, and served on the Gallery’s Board of Directors. The Whittier Art Association still maintains the Whittier Art Gallery, providing “exhibits of the best available art and fine crafts” as it has done for over 75 years. We are grateful for the many artists and art supporters that were inspired by Mabel Haig, and for those who continue to support the Whittier Art Gallery to this day. 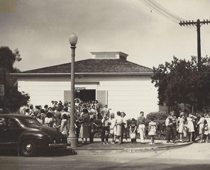 We wish to acknowledge the Whittier Museum, and Erin Fletcher-Singly of the Whittier Public Library History Room, for assistance in locating historical documents and other resources. Evan Martinez has digitized over 300 newspaper articles that tell the history of the Whittier Art Gallery. As our research continues, articles, photos, and documents will be added to this website. Questions can be emailed to: info@whittierartgallery.org, or call the Gallery at 562.698.8710.